Organic French Flour T80 Appropriate and recommended for use in all whole bread recipes or applications. 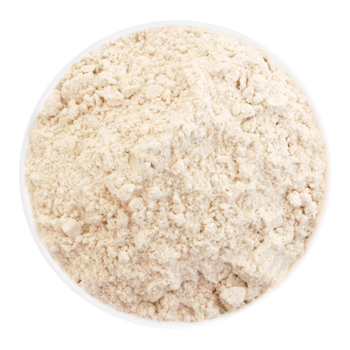 All of our flours are Unbleached, Non-bromated, and GMO-Free! Moulin d'Auguste is a traditional artisan meunier (artisan miller) and all of our imported French flours are produced from French grown wheat or grain in his mill located in Normandie, in the northwest of France. A dedication and passion for well-crafted flour is at the heart of his endeavor, and each year they produce a limited quantity of refined flours sought after by the most demanding pastry chefs and bakers. Additional important information: Quite a number of our customers who have experienced feeling ill or other reactions while eating bread and pastries made with flour in the U.S. , have reported that while traveling in Europe they are able to enjoy all forms of sandwiches, breads, and pastries without any similar reactions. A pastry chef friend of ours had the same experience: while eating bread or wheat-based products in the U.S. makes him feel ill, he has no such reaction to bread in France. Some experts we contacted think this could be related to either a GMO issue or due to additives in some U.S. flours. While we are not claiming to have run a scientific experiment or have the definitive answer on this issue, we wanted to share the experience of some customers who have contacted us about this. To be clear, the French flours available at L'Epicerie are NOT gluten-free, and if you have a medical condition that prevents you from eating gluten you should continue to follow the advice of a medical professional. Please note: Not all French flours are created equal! Due to the economic realities, a number of French millers are importing less expensive U.S. wheat in to France and milling it into flour. Since the flours are produced in France they do not have the U.S. origin on their label. All of the French flours at L'Epicerie.com are imported from France and come from certified non-GMO wheat, guaranteed to be grown and harvested in France before being milled into flour. French classification for flour is based on the resulting amount of residue after processing 10 kg (22 lbs of flour) in a 900_C (1,650_F) oven. T45 or Type 45 is the lowest and whitest flour with only around 45 grams of mineral contents left after the burning process and no part of the bran (outer enveloping shell of the grain) remaining. T65 to T150 are considered whole flour classifications with a higher degree of mineral contents and more bran leftover (higher number means higher bran content). A T45 flour corresponds to a 00 (doppio zero) italian flour type, with T65 a 0 italian type.